Decorating birthday cakes is often one of the first decorating tasks a novice attempts. A simple decoration and message are all that are truly required, making mastering the basic cake decorating techniques easy. When it comes to how to decorate a cake, the first thing to do is make the cake's base frosting smooth. On a buttercream cake, this requires using a spatula and hot water to smooth the frosting or using the paper towel method to create a smooth surface. For a fondant cake, a fondant tool made especially for smoothing makes it easy to get the right surface. Otherwise, use your hands or a light touch with a rolling pin to prepare the surface for decorating. Once the cake's base layer is prepared, move on to writing the happy birthday cake message and making a simple border around the bottom of the cake. Piping freehand: Decorators with good handwriting will find it easy to write the birthday message. However, even if you don't have the best handwriting, you can still freehand pipe a message. Use your computer to print the message in a nice font and practice tracing over that several times. Toothpick tracing: Draw light lines in the top of the cake with a toothpick using a ruler to make straight lines. Then use the toothpick to lightly etch the message onto the top of the cake. Trace over the lettering with icing. Fondant stencils: Use fondant stencils to cut out lettering for your message. Affix the letters to the cake using royal icing or fondant adhesive. Shell: Use a star decorating tip and hold the bag at an angle away from the cake. Build up a little frosting, then slowly release pressure as you pull away to create a shell shape. Some decorators prefer to pull up and then down again before releasing pressure to create a rounded shell shape at the start. Star: Make drop stars around the cake edges. Simply fit the size of star tip to the pastry bag and then squeeze, stop pressure and pull up to make a drop star. Place them close together. Dot: Use a round tip and pipe dots around the border. Make sure to stop pressure before pulling up to avoid a point on the top of the dot. 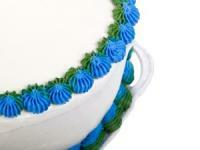 A ribbon is an easy way to make a border when working with fondant. Simply cut out a medium-sized strip of fondant that fits around the bottom of the cake and attach. Rolling fondant into small round balls and then placing around the bottom of the cake is another fast border technique with fondant. 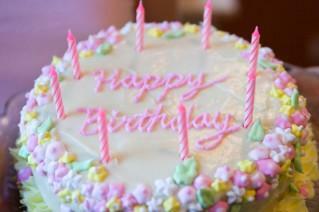 On small birthday cakes, the message and border, plus a few candles, may be enough. However, for larger sheet cake sizes or round cakes, a little more decoration is necessary. Flowers: Make gum paste flowers, buttercream roses or fondant flowers and place in the corners of the cake. Balloons: Balloons are easy to make using buttercream or fondant and are a colorful addition to a birthday cake for kids or adults. Bow: Cut fondant or gum paste strips and create loops. Place them in the shape of a bow on the top of the cake. Other easy decorations include purchasing edible images or cake topper decorations, making a piping gel picture on the top of the cake and adding fondant figures to the top of the birthday cake.